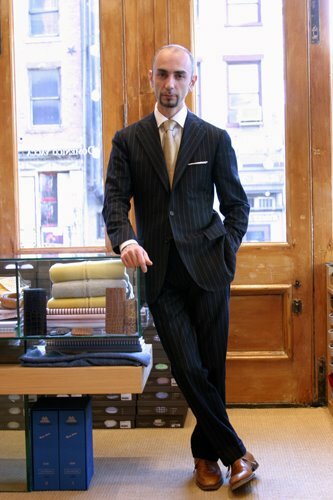 Comments on "Inside Domenico Vacca, Soho, New York"
The jacket fits impeccably. A half- windsor tie knot would probably be more fitting. Black shoes would have been my choice even though he looks well put together. It just goes to show that it's not what you wear, it's how you wear! They sure like their brown shoes with dark suits; what's up with that. I'd be interested in hearing the origin of this stylistic quirk. this may be overstating it, but pairing brown shoes with blue suits is, to me, one of the first indicators of a sophisticated style. i think your blog is very great! i havent found any blogs like this. can you recommend other great fashion blogs? uh , his suit looks black , and the shoes look tan. I'm not sayin the guys not stylin' , which he is , but I'm asking where it's comming from. ok, if the suit is black, sure there are questions. but take a look at the store, and the time of day, and the shirt/tie color, and what are the chances? so i think it's dark blue, which, combined with the shirt/tie color, opens the door to the color of those shoes. (medium brown? darker than tan to me). i agree it's not subtle, but i also notice that people with very nice, expensive shoes (not me sadly) often pop them a bit. good for them, and i like the look. guys, the brown/tan/natural shoe's an Italian thing. Italian's have a thing for coming up with "things". I know cause I'm one. Last time I wore black was my wedding 10+ years ago. Fortunately my lifestyle doesn't require it.